Paul Krugman on Debt, but Are Soaring Interest Rates Running Against Him? Nobel Prize-winning economist and New York Times columnist Paul Krugman. Still from NewsHour video. Paul Solman: The big brouhaha in economics recently, about which I posted some weeks ago, has pitted Nobel Prize-winning economist and New York Times columnist Paul Krugman and others against the famous academic research of Harvard economists Ken Rogoff and Carmen Reinhart, now famously challenged for a coding error and overstatement. The last few days have seen a flurry of thrust and parry, with Rogoff and Reinhart defending themselves eloquently and at length on Saturday against Paul Krugman’s recent contumely in an “open letter”. The estimable and evenhanded economics journalist David Warsh backed them and blasted Krugman in his weekly Economics Principals column on Sunday. Also on Sunday, Krugman responded sharply several times on his blog to Reinhart/Rogoff, as did Berkeley’s excellent economist Brad DeLong, backing Krugman on his blog,Grasping Reality with Both Invisible Hands. The basic fight is over a number and a question: when the ratio of a country’s debts to creditors exceeds 90 percent of what it produces in a year — a 90 percent “debt:GDP ratio” — does that represent a threshold or tipping point that will trigger a debt spiral? At 90 percent, will ever higher interest rates become inevitable, slowing the economy, leading to lower tax receipts, a greater need for borrowing, and ultimately, the kind of vicious circle that laid low Greece and Cyprus, Bear Stearns and Lehman? But all along, there has been at least one indicator of who might be right and who might be wrong: the actual interest rates any given country pays to borrow money. The higher they are, the greater the risk of lending to that country in the eyes of the world’s investors. The lower they are, the lower the perceived risk. And by historical standards, they have been low indeed. Rock bottom low. To be sure, other factors are in play. An interest rate is not merely a function of the perceived risk of inflation or default. But perceived risk is the big mover of rates and when the perception suddenly shifts, many have warned, watch out. So here’s a timely question: Will this month be remembered as the one that marked the big shift in interest rates, and a big shift from Paul Krugman’s assurance about borrowing to Rogoff/Reinhart’s warnings about cumulative debt? The reason I ask, on May 1, the interest rate the U.S. had to pay to borrow money for 10 years was 1.64 percent. This morning, it’s 2.14 percent. That’s a huge move — a rise of nearly one third. By historical standards, 2.14 percent is still a bargain basement interest rate to borrow for 10 years. Think of how quickly you might jump on it for refinancing your home, say. Moreover, whether May’s rise is a temporary blip or the long-predicted bursting of the bond bubble, only a fool would dare declare. But it’s certainly dramatic. Paul Solman: Is the U.S. government uncontrollable, borrowing more and more, getting deeper and deeper into debt? Paul Krugman: Funny thing is, every president between (not including) [Franklin Roosevelt] and Ronald Reagan left the debt-to-GDP ratio — the usual measure of the government’s position — lower when he left office than when he came into office. So we actually had a long stretch of very fiscally responsible government. Then we had a big increase under Reagan/[George H. W.] Bush, then it fell sharply under Bill Clinton, then it rose some under George W. Bush and then of course we had the worst economic crisis since the Great Depression. So looking at this on the government side, it’s not that we have an addiction to debt and deficits; it’s that Republican presidents run up the debt. That’s a very different story right? We actually don’t have a problem with government debt, not yet, but people are worried about the rise. Of course you can throw around big numbers. So you say “eight trillion dollars” or “10 trillion dollars” but the fact of the matter is that the US is a 16-trillion dollar-a-year economy and the numbers are not as overwhelming as they sound if you just give the raw numbers. Paul Solman: You’ve been accused of pooh-poohing the whole issue of debt as if it didn’t matter. You do acknowledge that there’s some point at which there’s too much government debt? Paul Krugman: I’ll turn deficit and debt hawk once we’re out of this depression, but not now. This is a time when it’s very costly to try to bring down government debt and quite likely self-defeating. It probably fails even in purely fiscal terms. [In other words, if the government borrowed less, it would so slow the economy, tax receipts would go down by more than the amount borrowed. Paul Krugman: I’ve always believed in expansionary monetary policy and if necessary fiscal policy when the economy is depressed. But that only became terribly relevant in 2008. What made sense in 1985, which was to say, “the Fed just stabilized the economy and the government should try to run good bookkeeping” does not make sense in the world we’re in right now because this is a once-in-three-generations crisis which has pushed us into a situation where somebody has to spend to support the economy and that somebody pretty much has to be the government. So the times have changed and so has the political climate. It’s just amazing how Milton Friedman would be considered a dangerous inflationist by the standards of today’s Republican party. Paul Solman: But can the interest rates on U.S. government debt stay this low? Paul Krugman: I look a lot at Japan, which is clearly not a story to be emulated but it’s interesting all the same. In Japan, people have been saying, “Oh, those interest rates are going to go soaring any day now.” It’s been 20 years that people have been saying that they’re going to have inflation from all that money printing. In fact, they’re trying desperately to break out of deflation. I just don’t see it coming. 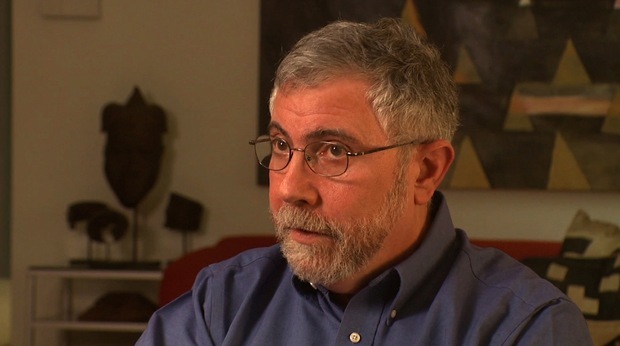 Paul Krugman: Well, you can’t know anything right? For all I know there’s an asteroid that NASA failed to detect that’s gonna hit. All kinds of things are possible. Not only is history opposed to that catastrophic view, but it’s very hard to tell the story. Suppose that the market decided that it really is worried about U.S. debt. That still doesn’t change the fact that the Fed can control short-term interest rates and it doesn’t change the fact that long-term interest rates reflect expected future short-term interest rates. So the worst case is a fall of the dollar. And the fall of the dollar would actually be good for us. It would help our exports; it would make us more competitive. So I can’t even manage to tell a coherent story about this alleged looming catastrophe. 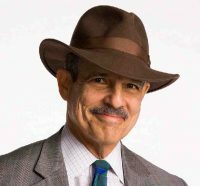 Paul Solman: But isn’t it quite possible that interest rates will simply shoot up? I mean they’ve been so unnaturally low for so unnaturally long? Paul Krugman: I actually don’t think it’s unnatural. You’ve got a depressed economy; the private sector is not seeing a lot of investment opportunities. Households are trying to save more because their houses have collapsed in value and they’ve got all this mortgage debt. Why shouldn’t interest rates be very very low? What’s unnatural about them being very low? And how do interest rates shoot up for the United States? We borrow in our own currency. The short-term interest rate is set by the Federal Reserve, which buys or sells Treasury bills, the long-term interest rate is, roughly speaking, an average of expected future short-term rates. How does this interest rate spike even happen? So when people talk about this you know attack of the bond vigilantes, interest rates will spike, I don’t think they’re even thinking through the mechanics of it. They don’t actually have a story about what happens on the ground to make that happen. Paul Solman: David Stockman says America has become addicted to debt and that those who don’t realize it are “debt blind.” When I pointed out that two and a half years ago he had said that interest rates were about to zoom and they’ve only gone down since, he said, “Well I just didn’t realize how crazy the Fed was and that they would keep interest rates low for this long,” but your point is the Fed could keep interest rates low forever? Paul Krugman: What’s stopping it? The argument is supposed to be that the Fed is printing all this money to keep interest rates low, but then isn’t the price of printing too much money supposed to be inflation and the Fed is actually worried right now that inflation is running too low, so where’s the inflation, where is the limit, you know what’s unsustainable here? What’s unsustainable I think is mass unemployment which is eventually gonna wreak a terrible toll on our society. I think the interest rate predictions are not the be all and end all, but they are something you can check and the people who keep predicting disaster are also people who’ve been predicting soaring interest rates by and large actually for four years and more. And at some point you have to say they just had the wrong model of how the world works. Paul Solman: Worried about un- and underemployment, I’ve suggested, as a thought experiment, an “MMM”: a Mass Massage Mobilization in which the government borrows the money to support a program that induces every adult American, by tax credits or otherwise, to get one massage a week. That would employ seven-10 million Americans, none of whom would need a conventional four-year Bachelor’s degree. Would you be in favor of something like that? Paul Krugman: When the government goes out and borrows money these days, it’s not taking money that the private sector would otherwise have invested; it’s actually taking money that would otherwise be idle and so actually almost anything the government does would boost the economy right now. Remember, we ended the Great Depression not just with unproductive spending but with actually destructive spending, right? We spent a lot of money on tanks and bombs and planes and still ended the Depression. So I think there’s probably better stuff to do than massages, but sure. This goes back to Keynes and the coal mines right? Famously, John Maynard Keynes said that if you propose any kind of government spending, people tend to object because they say there’s some more useful way to do this. So why don’t we do something completely useless? Why don’t we bury bottles of money in coal mines and then let the private sector dig them up again and that way no one will object that it could’ve been spent better. And the actual spending will take place in the private sector so there won’t be more government employees and it’ll still stimulate the economy. Of course it wasn’t a serious proposal but he was making a point. My version of that was we have to invent a threat from space aliens. It would require us to do a lot of infrastructure spending to prepare for the alien invasion. And if, two years later, we say “whoops, no space aliens, but gee we have full employment,” that would be fine. So I don’t think massages is where I’d go but I would take anything rather than what we’re doing right now, which is austerity that is actually killing the recovery. Paul Solman: But massages, everybody’s better off. I mean that’s not burying dollar bills in bottles in coal mines, that’s actually benefiting people. Paul Krugman: Well sure, maybe people should form circles in the street, be paid to form circles in the street and sing Kumbaya, that might be even better. Sure, whatever. Paul Solman: But there’s got to be a point at which we simply are taking on too much debt, no? Paul Krugman: The government is a long way from having a debt problem. The household sector has too much debt, that’s clear, we see that’s what’s driving our depressed economy. So it’s not that debt is never a problem. The question is: is government debt a problem right now and is it enough of a problem even in the future to mean that you shouldn’t be doing whatever it takes to get full employment now? Note: We plan to post former Reagan budget chief David Stockman’s views on debt tomorrow.